The Ecology Center began one of the nation’s first curbside recycling programs, on the heels of the first Earth Day. As operators of that same recycling program through the decades, we have had a front-row seat to the recycling industry’s complex evolution. In those early days, we fought to be taken seriously and to demonstrate that a closed-loop economic model was possible. Today, recycling has moved from the margins to the mainstream, a major achievement. But in doing so, it has become unmoored from its original values. For recycling to return to its roots – as an alternative to wasteful, mindless consumerism and environmental degradation – a reckoning and re-imagining needs to take place. The Ecology Center is central to this effort, and the support of our members is essential. Please donate to the Ecology Center today, and read on to learn about our latest campaign. Nationally, what we call “wishful recycling” is the norm. Companies want people to feel good about their products, so they insinuate that all sorts of packaging and materials are recyclable. Well-wishing people then place those things in their blue curbside carts, hoping that the items will magically transform into new products! While metal, glass, and clean paper continue to have value and be recycled in a closed loop, many low-value plastics do not. In January of this year, China ceased to accept US recycling contaminated with dirty, disposable plastics, creating a crisis in the recycling industry. Ships full of US recyclables, including low-value plastics and food-soiled paper, are being turned away from China’s ports. Bales are piling up at many recycling centers. 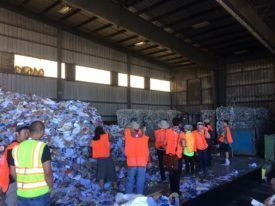 Some recycling operators are choosing to truck it to landfills. Others are seeking to ship it to Southeast Asia, where labor and environmental standards are even lower. Since the beginning, the Ecology Center has been the voice in the wilderness, willing to tell the inconvenient truths about recycling’s realities. The support of our members has enabled us to educate the public, collaborate with other waste experts, and pursue ambitious, forward-looking policies to deal with the problems that recycling can’t fix. Most single-use plastic foodware has no value in today’s recycling markets. With China’s new ban on importing plastic scrap, cities are actually paying to get rid of it. Much of the low-grade plastic that now gets shipped to the global south may end up dumped or burned, despoiling their environment and poisoning their workers. This is a global environmental justice issue that must stop. The refrain “reduce, reuse, recycle” is a hierarchy, with “reduce” as the best choice. Recycling should be the last resort, not the first. When products are not actually recyclable, the Ecology Center believes that the public deserves to know the truth. Right now, the main component of street litter is unrecyclable, single-use foodware – think straws, lids, forks, clamshells, food wrappers. These disposable items cost cities millions to mitigate, and is the biggest category of trash collected during shoreline cleanups. Along with expert waste allies and the leadership of Berkeley’s Mayor and City Council, the Ecology Center took the best ideas from other cities and campaigns, and are now advancing an ordinance that would make a serious dent in the pile of disposable foodware. If enacted, it could serve as a blueprint for other communities, as our Soda tax and Plastic Bag Ban have. The proposed ordinance requires that: 1) only reusable foodware can be used for dine-in service, 2) all takeout foodware must be approved as recyclable or compostable in the City’s collection programs, 3) food vendors charge customers $0.25 for every disposable beverage cup and $0.25 for every disposable food container provided, promoting a “bring your own” culture, and 4) disposable compostable straws, stirrers, cup spill plugs, napkins, and utensils for take-out are provided only upon request by the customer or at a self-serve station. Berkeley’s Disposable-Free Dining ordinance builds on a long history of initiatives aimed at phasing out products with high environmental costs, such as single-use plastic bags and styrofoam. At every stage of these historic movements, the Ecology Center has been deep in the mix, pushing for a Zero Waste future where plastic trash doesn’t fill our oceans and waterways, or poison our air and food. Individuals like you provide the funding that allows the Ecology Center to collaborate with other thought leaders to make change happen. Your donations enable us to share the truth of recycling’s realities with thousands of people, through events like Plastic-Free July. And your giving supports our Youth Environmental Academy, which empowers local youth with a deep knowledge of waste issues. Please help us continue to lead the charge for a more effective and reality-based approach to waste and recycling. Member support has helped us build a coalition to develop the ordinance and advance it, but now we need support to get it across the finish line. Please consider donating today. This entry was posted in Blog, Featured and tagged Berkeley Curbside Recycling, Plastic-Free July, Zero Waste by Ecology Center. Bookmark the permalink. I do pickups for the Berkeley Food Pantry which has made me acutely aware of the “side of garbage” that accompanies a lot of food packaging. I’m particularly concerned with the food packaged at stores and meal producers such as Thistle (on 5th St. in Berk. ), and even at Farmer’s Markets. I hope that these food sellers are included as “vendors” in your proposed ordinance. Thistle even packages avocados in individual plastic containers! Of course this does nothing to deal with ‘convenience’ or individual serving packaging that is so pervasive but that is a matter for another day.